Sarah has been out to record some of the Bronze Age rock art that lines the Atlantic coast of Spain. Here she tells us why working with these panels is an adventure of body, mind and moonlight. DigVentures’s next archaeological adventure is taking place in Costa dos Castros on the northwest coast of Galicia, Spain. Here, everyone who signs up to join the field team, will begin work on an as-yet unexcavated Iron Age hillfort. Exciting stuff! But this narrow strip of coast is not just remarkable for its unusually high concentration of hillforts, it also has one of the highest concentrations of Bronze Age rock art anywhere on the Atlantic. These rock carvings, or petroglyphs, are an incredible source of artistic evidence from the ancient world, but the methods we use to explore, investigate and look after rock art is a pretty unique skillset. At least, I don’t know of any archaeological site where exploring the hills at midnight with a torch is an acceptable research method! We’ll come to that later, but yes, studying rock art in the field… It’s archaeology, Jim, but not as we know it! 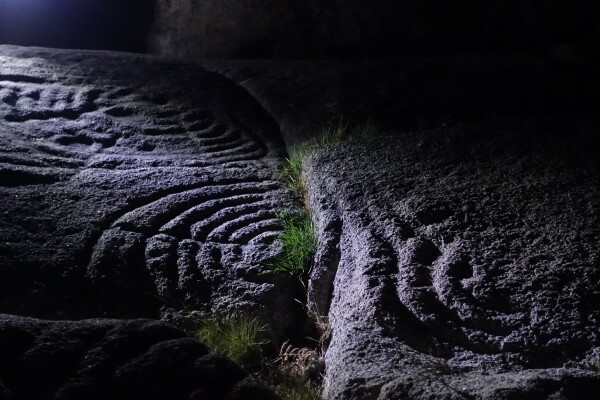 Galician rock art is pretty unique. 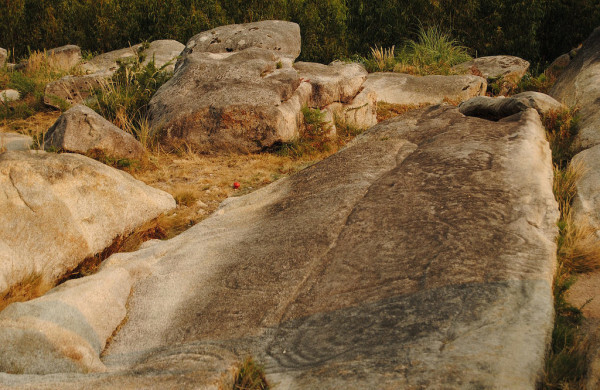 These cryptic symbols, pecked out on flat areas of granite, are often based on concentric circles or spirals, although some also depict animals, boats and typical Bronze Age weapons. Unlike excavating a stone structure or building, rock panels can be pretty difficult to read – on an archaeological site, artefacts and stratigraphy will provide the clues to how old things are and what their purpose was, but you don’t often get that with rock art. So we can’t ever really be sure exactly when they were made, what they were for or the complex meanings they held for their Bronze Age creators. They are a true mystery! Mind you, it does mean you don’t have to dig – the panels are already there, nestling in the undergrowth of the eucalyptus forests or scattered across the high gorsy plateaus. Most of the panels are well-known locally, but there are still some surprises to be found in the undergrowth. Exploring and searching them out is much more like something Indiana Jones would than digging! So what can we do to understand these things that are at once so accessible, but also unknowable and inscrutable? Rising to that challenge is an adventure of the body and mind. 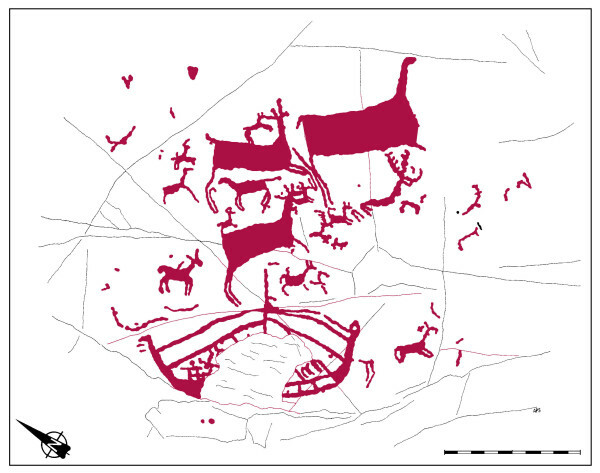 Bronze Age rock art panel from Costa dos Castros depicting deer, and a Mediterranean boat. At one point, people believed there was treasure under this rock, so they tried to blow it up, damaging the carved boat. At A Cabeciña we spent a month scrambling over rocks and gingerly negotiating the fearsome Galician gorse to try and understand how the rock art sits within the wider landscape – its location, orientation and relationship to other rock art or prehistoric features may help decode what it might have meant. Did they mark territory, or show the best areas for certain kinds of activity – say, hunting – or even mark sites of ritual activity? The relationship to water, streams or even the restless Atlantic may be very important – we just don’t know, but we can observe and record, and hope that one day a pattern will emerge. It is hands-on work too. While it is not good practice to touch the rock art unless really necessary – and we would certainly never walk on it or chalk on the motifs to make them clearer – sometimes a gentle brush of the fingertips can help reveal what the eye can no longer easily see. We have also been experimenting with 3D photography which can pick up a lot of detail that the naked eye can’t. But sometimes, you do have to use your hands. Two of the as-yet-undocumented panels we found were so incredibly faint and in permanent dappled shade, which made it a real struggle to see anything and our attempts at photography was futile. So, Becky and I spent several hours trying to coax some of the secrets out by touch. We were quite pleased with ourselves for discovering a group of four small concentric circular motifs. Knowing that the light had been a problem, we decided to return after dark with torches. This night time adventure became a voyage of discovery. Making our way through the forest undergrowth with all the nocturnal wildlife chirping away was exciting enough, but when we re-found the panels in the moonlight and shone our torches on them, we discovered something amazing: what we hadn’t been able to see in the difficult light of day became abundantly clear by night… here was an even more complex array of rock art than we had anticipated! The four small concentric circular motifs were actually twice the diameter we had suspected – they were nearly a metre wide – and many more in number. The panels don’t give up their secrets easily, but when they do, it can be absolutely astounding. What Kind of Hillfort Have We Actually Found? How to Dig an Iron Age Hillfort, Spanish Style!